We are the closest rental to lake in the area. Relax and unwind at this lakeside cottage. Sip sweet tea on the front porch or flip burgers on the grill as you watch the sun glistening on the water. Grab your beach towel and head to the lake to take a dip or sit on the shore and watch the boats go by. After a day of hiking and fun in the sun, relax in the hot tub or make s'mores over the campfire. Enjoy! Situated very privately on the property, this farmhouse/cottage offers expanded options for couples or families. Nearly 100 acres with dedicated hiking trails, allow guests to experience the peace and quiet of nature while still allowing for a comfortable living arrangement. Split floor plan maintains the privacy of a beautiful master bCedroom complete with en suite featuring, walk in shower, jetted tub and double vanities. Two other bedrooms allow options for extra sleeping arrangements if needed. This rental includes in kitchen dining at bar and table, but also gives option of formal dining room. Gracious living area has big screen tv with directv service. Whole house wifi will keep you connected as much or as little as you desire. Situated on the Upper Cumberland Area we are directly off the Ring of Fire Tourism Trail in Tennessee. Close to Cummins Falls, one of Tennessee's newest state nature parks. We do ask that young travelers be at least 12 years of age. Welcome to the Hook, Wine & Sinker lake rental with fabulous lake view, recreational water sports, hiking and other outdoor adventures. Our home is new and we have stocked this vacation home with all the amenities you would need while enjoying the lake life. Kayaks, fishing poles, picnic baskets plus more, are here for our guest. Our home is located close to Defeated Creek Marina and centrally located in middle Tennessee with 7 waterfalls within same-day driving distance. Home features private adult bedrooms with french doors leading to front deck with lake view. Wonderful place to enjoy your morning coffee and afternoon sunsets with a glass of wine. 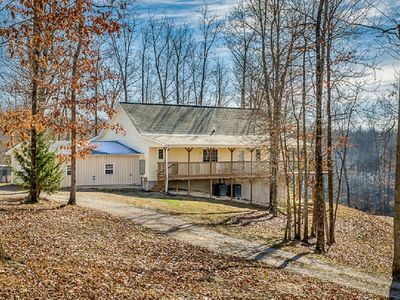 Get away from it all in this traditional wood cabin in the hills of Tennessee. Peace and quiet above the historic town of Granville, on Cordell Hull Lake. Great views across “them thar hills” from the wrap around porch. Located an hour east of Nashville this a great base from which to explore and enjoy Middle Tennessee. Step back in time when you walk through the door into mid-century America. Drink coffee in a kitchen straight out of the 1950s. Relax on the authentic wagon wheel furniture with a cocktail from the vintage bar. Soak in the cast iron bathtub in the period tiled bathroom. 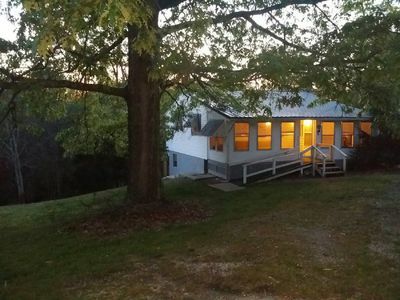 The whole cabin is yours and sits on 2 acres. There is a hidden modern TV with satelite, DVD player and a Xbox 360. The stove is a 1956 GEC Spacesaver but there is a microwave for those that prefer something a little more modern. There's also a kurig coffee machine and modern hair drier & iron. Near to the small historic town of Granville on Cordell Hull lake. Miles of scenic drives around rural middle Tennessee. Local towns for shopping, eating & antiques are Carthage, Gordonsville and Cookeville. For more small town USA visit Gainsboro, Celina, Livingston and Algood. CenterHill Lake is 30 minutes away. Easy day trips to Nashville, Knoxville and Chattanooga. You'll need an a a boat.... Lots of motorcycles travel around this area due to the beautiful scenery and sweeping rural two lane blacktop. I've even seen a bicycle on occasion! This is a great place to get away for peace and quiet! It is also within a few steps to the water!! Great for fishing, kayaking, and a mile to a boat ramp! It is located a half mile to Salt Lick Campgrounds! This is a very old log home rebuilt in 2017. If you like rustic and being in the country this is the cabin for you! The cabin has a breath taking view of water!! 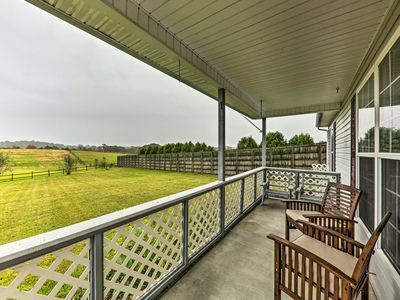 You can see animals right from the front porch, such as, deer and lots more!! This tiny house is set on a lakefront property . Full use of lake and access. 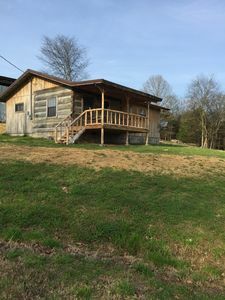 Hunting on property available as there are plenty of deer and tree stands etc. Utilization of fresh rain water catchment and well water. Premium Ph-filtration system for drinking water. Full service meals upon request for those that want to enjoy their stay and not have to cook or clean. Target practice and outdoor adventure tactics, techniques, and procedures available upon request and with release of liability form . We can teach you many things in regard to water catchment systems, off grid living, homesteading and much more! Come cut a tree down and take some wood back with you (we have a saw mill), hunt, fish, utilize the land any way you want ! Great way to spend yours new year with a bang (fireworks included) . Beautiful lodge get away for peace & quiet great for family reunions! A more private camping experience. If you are tired of crowded public camping sites on a postage sized space this maybe your place to camp. 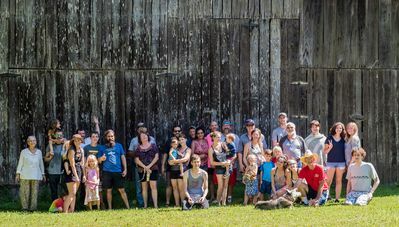 The Walker Farm has been in our family since the 1870's and is a 75 acre parcel of wooded hills and bottom land. You are welcome to pitch your tent anywhere you choose . I can show you some popular places that previous campers have chosen. 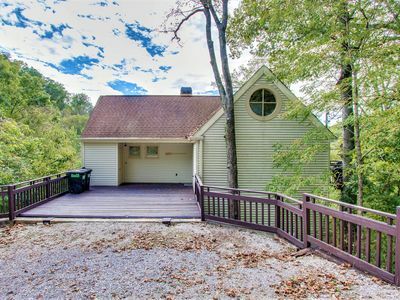 We are close to Cummins Falls State Park, Dale Hollow Lake, the small town Squares of Gainesboro and Celina, and the larger city of Cookeville. All of these locations are a 10 to 25 min drive. You will have access to a commons area , a modern mobile home with a full kitchen , two bathrooms and showers with plenty of hot water. An inexpensive way to explore the area and camp in a more private setting. Twenty five dollars per tent of four persons. Eight dollars per person after four. Thank you for your interest. Our simple farm life on our quiet, remote property welcomes you into our family. Rest in a private cabin or in a tent, and wake up to beautiful, peaceful surroundings. We’re on a very private place in the country, surrounded by various types of livestock, wildlife, and freshly-growing food. Guests have access to the entire main level of the cabin which is handicap accessible. (A tenant lives in basement apartment) Guests are welcomed into and becoming part of our extended family during their stay. During some seasons, optional services are also provided. Some require additional fee. •Enjoying freshly prepared meals or treats •Gathering eggs •Picking fruits and or/vegetables •Milking the cow (or watching) •Riding a horse Because we live remotely, phone and internet service can be challenging. Let us know ahead of time what your needs are and we’ll let you know what to expect. 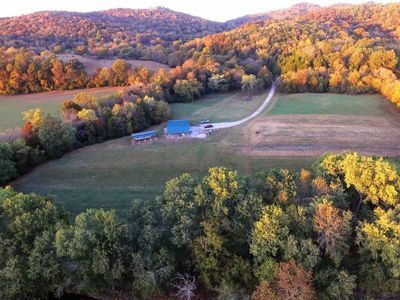 182 Acre farm on the Caney Fork River. 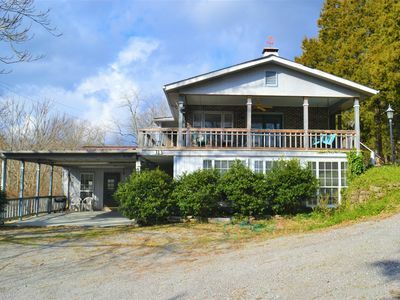 The property has a large barn with a 2 bed room and one bath home. Custom Cabinets and granite countertop. Living room has 60" flat screen TV with beautiful rock fireplace. 8-10 acres are open and the remaining is woods. 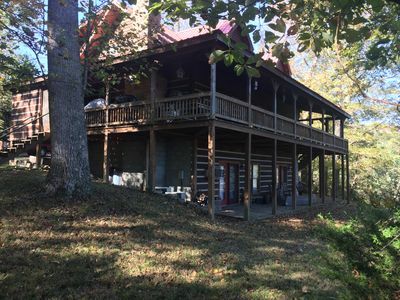 Property is directly on the Caney Fork River and also has miles of trails. Lots of wildlife. Central A/C, wood burning fireplace. Queen in master, bunk beds in 2nd BD Queen/Tall Twin. Living room has a futon. Property is very private and located on a dead end street. Easy access to the River and a beautiful rock bar that allows for great fishing. Talley's Cabins And Breakfast By Dale Hollow Lake.. Right Where You Want To Be! Enjoy peace and quiet! The home offers the comforts and conveniences of a resort style vacation home while guests enjoy the natural beauty of 31 acres. 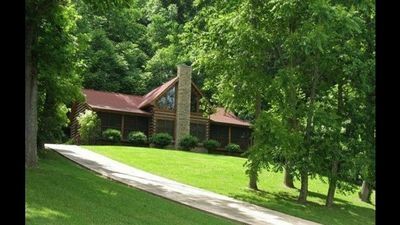 The home is located near many outdoor destinations including Dale Hollow Lake and Standing Stone State Park. 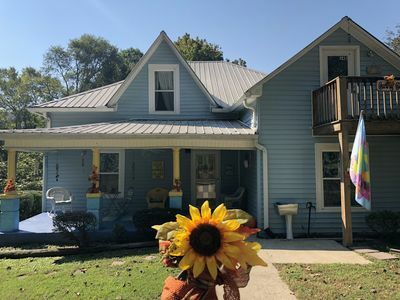 It is also located within 30 minutes of Celina, Livingston, and Gainesboro offering shopping, restaurants, and activities in a small town setting. The open living space has vaulted wood ceilings and large windows and french door that offer natural light throughout. The space features a well equipped gourmet kitchen with a large island with seating for four, dining room table for six, couch and chairs surrounding a gas fireplace, and small game table. The over-sized Master bedroom has a king sized bed, desk, and lots of closet space. The bathroom includes a large shower with double shower heads and large vanity. Step outside the french doors in the bedroom and have your morning coffee at the chairs and table. The small second bedroom has a queen size bed and a full bathroom. The third bedroom is an open loft on the second floor. It has an AeroBed Comfort Lock Queen air mattress. It is a large loft so you will still have privacy. You have access to the entire upstairs with your own private entrances. The upstairs access includes the master bedroom and bath, second bedroom and bath, half bath for guests, loft on the second level, gourmet kitchen, dining room, and living room. You have access to over 1200 square feet of deck with rocking chairs, tables, and a gas/charcoal/smoker grill. There is also a small fire pit if you would like to enjoy a fire in the evening. You may pick any vegetables or herbs that are in season in the garden to prepare a delicious meal. I live in an apartment downstairs with my dog, Max. I am happy to answer any questions or assist with any needs but you will have as much privacy as you desire. Feel free to say hello if you see me in the garden or feeding the rabbits. The lake-view cabin has been uniquely designed to accommodate different rental needs. The rental includes the entire 2900 sq.ft. living space. This includes the original 2200 sq.ft. of living space with an adjoining apartment of 700 sq.ft. The apartment can be left open to the other 2200 sq.ft. or you may close and lock the door for privacy. It also has its own outside entrance. 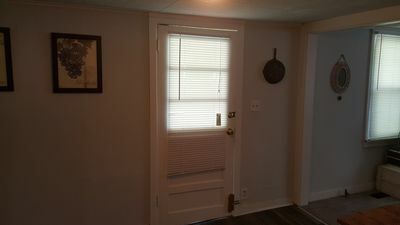 Your rental will include 4 BR (master w/ king bed and lake view; 2 Queen; 1 Full), 4 full baths, 2 pull-out couches, 2 fully stocked kitchens, 2 flat screens w/ DirecTV, sun-room with lake view, deck w/ lake view, hardwood in kitchen and living area, carpet in bedrooms, tile in bathrooms, walk-in laundry room w/ washer & dryer. We have a hot tub on the deck (additional $150.00) Need more space? We also have a cabin next door that sleeps 12. VRBO #701141. 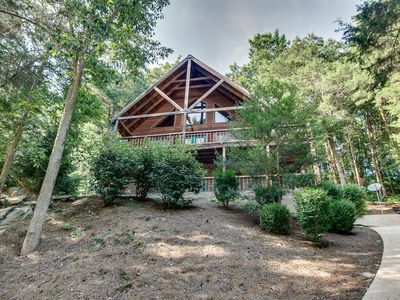 Unique, cozy, country cabin on Dale Hollow Lake. This cabin is a four bedroom, two bath split bedroom design making it perfect for family or friends. The cabin is a couple of minutes from Dale Hollow Marina and about five minutes from Cedar Hill Marina. It sets on a level lot with lots of vehicle and boat parking. There is a large wrap around deck with a charcoal grill .that is lake view. Cabin is completely furnished for your pleasure. 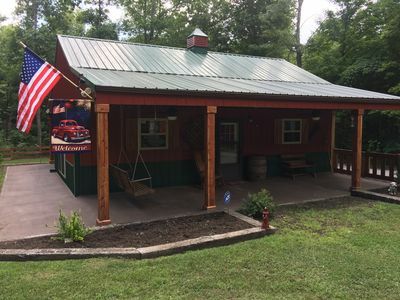 Beautiful 2 bedroom cabin located 1/2 mile from Caney Fork River/Betty's Island, which is known for the best trout fishing in the State of Tennessee. Center Hill Lake is located only a 15 minute drive away. Canoes and kayaks are available to rent for a great outing on the river. Cabin is fully furnished and sleeps 6 with all the necessities for a relaxing stay. This is very family friendly and is surrounded by all the beauty of Middle Tennessee. One hour from Nashville . Talley's Cabins and Breakfast By Dale Hollow Lake. Right Where You Want To Be! 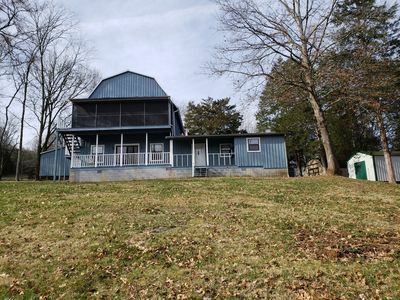 Completely renovated, secluded home in the quiet hills of Dale Hollow. Perfect getaway for fishing, horseback riding, other water activities, or just to get away for some peace and quiet. Nearest marina is Holly Creek, just minutes away with multiple other options in the area. Close to horse trails and Downtown Celina is a 10-15 minute drive with grocery stores, antique shops, and local restaurants. Created specifically for families, Cabin 7, a dockside cabin rental provides a beautiful view of houseboat docks. Cabin 7 features Satellite TV, DVD Player, Eat-In Kitchen, Large Bathroom, One Queen Bed, Twin Bunk Beds, Oven/Range, Refrigerator, Silverware/Flatware, Cookware, Linens, Shower, Patio Furniture, Charcoal Grill, Deck with Lake View and Air Conditioning. Mitchell Creek Marina & Resort is very kid-friendly, offering activities on, around and off the water, from watercraft rentals to bumper boats (during special events), a volleyball court and a game room. Lovely Victorian home apartment with private deck entrance. Can sleep up to 6. One bedroom and additional sleeping set up in common area. Note* ( 1 full bed, 1 queen air mattress, one couch and one love seat in living room. ) 1 bathroom. Picturesque views where rabbits and squirrels are often seen. 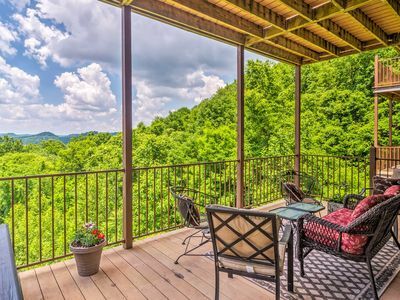 Guest may enjoy nearby Center Hill and Caney Fork River for fishing, boating, or kayaking. Take a stroll along quiet country roads or go hiking at nearby Edgar Evins State Park. Antique shopping is available in small town of Carthage only minutes away. Then there is Country Music City U.S.A. Nashville and home of Titian’s football team and Nashville Predators NHL. FadeAway Lodge is the perfect place to sooth your soul. This luxurious 5 bedroom lodge features a spacious open floor plan with a vaulted ceiling, gorgeous hardwood flooring, rustic decor, and views that you will remember for a lifetime. On the main floor the family room features an open view with floor to ceiling windows for the magnificent view. The open dining area provides ample seating for guests. The kitchen is a chefs dream. Each bedroom is set up for ample privacy and features a flat screen TV. Four bedrooms feature luxurious queen beds decorated for your relaxing delight. One of the four rooms features a double trundle with the queen bed. The fifth bedroom has custom built bunk beds perfect for the kids to bond and tell bedtime stories. With two of the bedrooms upstairs and 3 of the bedrooms on the lower level there is ample space for the whole family. The lower level also feature the perfect gaming area. Games include, Foosball, ping pong, darts, pool, and cards. Enjoy a great movie or the game on TV while interacting in all the family festivities. This home features hi speed wifi, Netflix, Apple tv, and DirectTV Now This one of a kind lodge features a full wrap around deck on the upper level with ample seating room where you can enjoy a sunrise or a sunset over the water. The lower patio is perfect for hosting an evening dinner on the cafe style patio. The secluded cove below the house is a fisherman's dram come true with a stream the trickles down into this honey hole of fish. There is a community boat ramp less than a mile away at the end of Sunny Point drive. You are also just minutes away for Cookeville Boat dock for all your boating a supply needs. Visit and learn more about this home at . Don't miss out on this treasure and book now! The Red Fox Inn is located in the beautiful small town of Baxter, TN. This is a lovely two story, four bedroom inn with two full bathrooms. The Inn is great for friends and families to come together. The home has recently been remodeled and new to short term rental. We have an added bonus that is completely optional. If you have a special occasion, anniversary or birthday, ect. We can arrange for Chef Barry from Ireland to create a special meal for you. His menu and prices available upon request. The space The Inn is only 8 miles to Cookeville and Tennessee Tech University, 2 ½ miles to Interstate I-40, 9 miles to Cummins Falls State Park, 1.4 miles to DelMonaco Winery, 8 miles to Burgess Falls State Park, 13 miles to Center Hill Lake, 67 miles to the Nashville Airport, one hour to Nashville. The Inn is located in between Nashville and Knoxville right off Interstate 40 and only two hours to the Great Smoky Mountains. The Red Fox Inn is a wonderful place for family retreats and friends getting together. If you have a birthday, anniversary, family reunion or corporate event the Inn would be the perfect place to celebrate. There are plenty of shades trees, the game room, horse shoes, badminton, volleyball and parking. There are 4 cleared acres that can be used for larger functions. The master bedroom and living room have cozy gas fireplaces. Each bedroom has their own private Wi-Fi cable TV along with the living room and game room. The kitchen will seat eight and the dining room will seat six also for large groups. The two bedrooms downstairs have king beds and all the bedrooms have new mattresses and bedding. One bedroom upstairs has a king bed the other bedroom has a queen and twin bed. This room also has a walk out balcony where you can sit outside, drink your coffee and enjoy the beautiful grounds of the Inn. There is also a nice size laundry room, guest are welcome to use. There is a large deck with a beautiful gazebo behind the house and a nice bricked area, perfect for cookouts and entertaining. At night you can relax in the 6 person luxurious hot tub, with 50 illuminated oval titanium gray and stainless steel jets. Enjoy the Infinity am/fm/cd/blluetooth/mp3 player and all features are illuminated for enhanced ambiance and beauty. All while looking into the beautiful night sky and watching the shooting stars. For family fun, we have the Red Fox Den, a large game room with fun entertainment including a pool table, arcade games, electronic darts and other games. Also enjoy watching sports on the large flat screen while playing cards. The game room is perfect for all ages. If you have an event that you would like to have catered, we are proud to introduce our friend, the well-known Chef Barry O’Connor from Cork, Ireland. We are so fortunate he has settled right here in the heart of the Upper Cumberland. Chef Barry has over 25 years of experience and was trained in the finest culinary schools. After working at some of the best restaurants in England, France, and Ireland, he later owned and operated his own restaurant in Cork. Over the years, he opened and owned other pubs, as well, winning “Pub of the Year in Ireland in 1999”. If your celebrating a special occasion, anniversary, birthday or a larger event Chef Barry will come to the Inn and prepare a 5* meal just for you. If this is something you’re interested in, we can contact Chef Barry for a menu and pricing. BB's cottage is a warm retreat, with that cozy feeling of being at mom's. It is located in Cookeville Tn, just off the road known as the Gainesboro Grade. It is 4.5 miles from Tn Tech or Cookeville Regional Medical Center and only 3.5 miles in the other direction from the famous Cummins Falls State Park. BB's is decorated in an eclectic mix of Tn antiques and unusual local decor. You will find comfotable beds, a fully equipped kitchen, central heat and air, washer and dryer and everything you need to make your trip to the area a comfortable one. We also have housing for large groups. 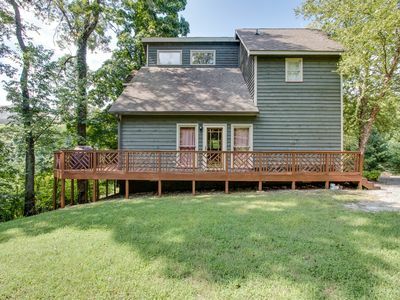 This home sits on an acre and a half, some wooded, great for walking in. There is a circular drive and a 2 car carports. To the left of the property is a drive down to the back of the property and another 2 car carport. There is plenty of room to bring your kayaks, canoes, bikes, etc.. There is a covered area behind the brown shed where you can leave your "toys". There are security lights and motion detectors on the property. There is a beautiful buffalo farm with horses as well, diagonally across the road, you can watch them from the deck. You can also walk across the road (or drive) and see them up close. There is a wrap-around deck to sit and enjoy your morning coffee or your afternoon beverage. There is also a covered front porch with seating to enjoy the setting sun or the outside when it is raining. 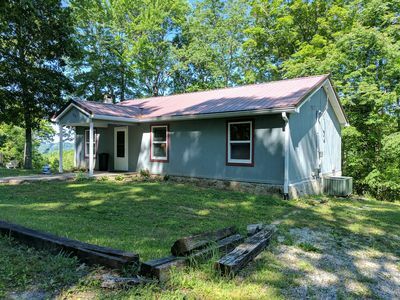 The property is centrally located to lots of waterfalls (Cummins Falls, Burgess Falls, Fall Creek Falls and many other hidden falls that you will find along the way), hiking trails, state parks (Standing Stone, Rock Island, Cumberland, Fall Creek, etc. ), lakes (Center Hill, Dale Hollow, City Lake), rivers (The Roaring River, The Caney Fork), as well TTU and town. There are tons of restaurants in town....There is restaurant row on Interstate Drive, with restaurants up and down. Then, there is the historic West Side, with lots of privately owned restaurants and boutiques. Antiques up on The Square (with more restaurants) and more antiques stores tucked here and there. To the left of us, about a mile up the road is a little convenience store and gas station. To the right 2 miles is a Dollar General. I keep a red loose leaf information notebook that has "need to know" info about the house and the area. We have wifi, internet and cable. We also have books for reading while you are our guests. We also have an extensive DVD&VHS library (along with a player) for you to enjoy while here. We have games, puzzles, cards, puzzle books. Whatever is in the house (with the exception of the closet in the den that holds our supplies), is yours to use, eat, drink and enjoy while you are here. We have two bedrooms with double beds and a futon that sleeps 2, so overall the home can sleep 6. The price per night is for 4 people. There is an additional charge per person, per night, over the four. It has an open floor plan, living room, opening to dining room, kitchen to the right and straight ahead you step down into the den, with French doors that open to the deck. There is lots of light. Down the hall is a full bath, with a generous garden tub, and two bedrooms. The master bedroom has a half bath attached to it. There are lots of pillows and throws to snuggle down under...Lots of dishes and glassware...a full is a toaster, an iron, small ironing board, microwave, side by side refrigerator, radio and cd player (so bring your cd's). We do ask that you be considerate of the neighbors, who are not on vacation and need to sleep, so keeping noise and volume to a reasonable level is appreciated. We also ask, that when standing on the front porch and looking at the drive, you enter on the left and exit on the right. We ask this, as there is a significant blind spot and you cannot see approaching vehicles when leaving from the left driveway. It is a non-smoking house and no pets. 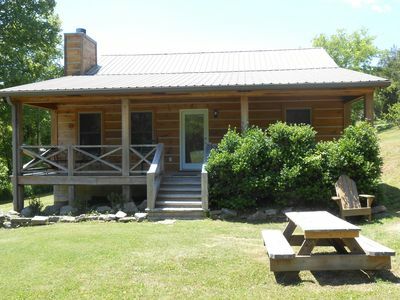 great get away just 3 miles from Tennessee Tech and Cookeville. 25 minutes from 3 major lakes. 3 miles from Cummings Falls, one of the best in the South. 1 .5 miles from a 18 hole golf course. Perfect Retreat and you can hear the creek flowing from the rear windows. 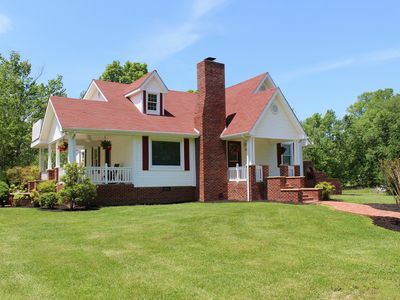 True Tennessee decorated in country and vintage style, but with modern conveniences too. Great spot for home feel without the hotel hassles. 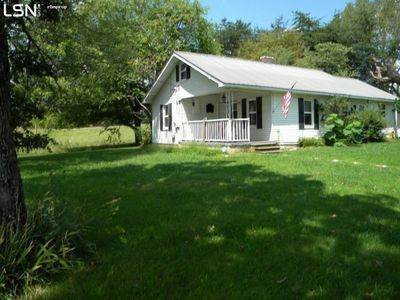 4 BEDROOM 2 BATH FARMHOUSE NEXT DOOR AVAILABLE TOO! Cummins Falls State Park is an idyllic, but rugged, 211-acre day-use park located nine miles north of Cookeville on the Blackburn Fork State Scenic River on the Eastern Highland Rim. 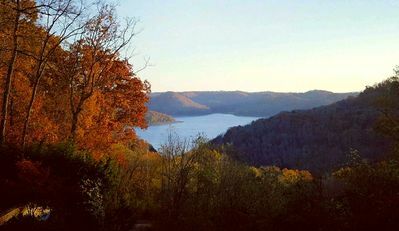 Located in the Cordell Hull Watershed, the area has been a scenic spot and swimming hole for local residents of Jackson and Putnam counties for more than 100 years. 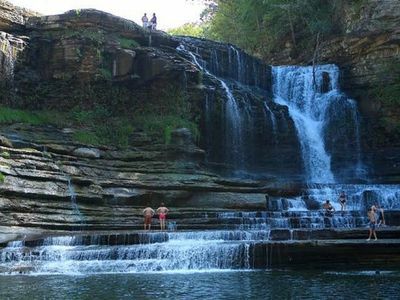 Cummins Falls is Tennessee’s eighth largest waterfall in volume of water and is 75 feet high. The Gorge The gorge area of the park is a natural feature unaltered by man, as is most of the park. While very beautiful, this is a rugged area and there are inherent hazards. The gorge and waterfall are not easily accessed and can only be reached by foot. There are two routes that descend into the gorge. One is approximately one mile and the other is approximately 1.5 miles. Both routes are steep with uneven terrain and have significant elevation drops. Natural trail surfaces are varied and include water crossings, boulders and other obstacles. Gorgeous Lake Front View of Center Hill Lake from your private covered patio. Minutes from Center Hill Marina and Cove Hollow Boat Dock. This 1800 sq ft. home is completely and uniquely furnished & appointed with everything you need in this luxury condo. Two flat screen TV's, DVR, DVD Player. Granite counter tops, Upscale appliances, travertine floors in kitchen & baths. Whirlpool tub in large master bath. Three bedrooms and two full baths. Laundry room with front loading washer & dryer. Enjoy meals using our new Patio furniture. for covered patio. First time this unit has been offered as a rental. Ideal location in this gated community. Gated community pool and hot tub. Only 1 hour east of Nashville Interational Airport. Marina restaurants a short distance by water or car. Short distance to hiking in Edgar Evans State Park. The Art community in Smithville available to enjoy. Spend a relaxing weekend or longer in the beautiful Tennessee hills. Once you enter this wonderful condo you will feel the privacy of a single family home. Must be 25 years old to rent this home.. Keywords: Lake Front View from covered patio. Easy access to beautiful Center Hill Lake, Center Hill Marina and Cove Hollow Boat Dock for boat rentals or launching your boat just down the hill. This three level custom built log home offers year round unobstructed views of Center Hill Lake and the Center Hill Marina. Relax in the rocking chairs or swings on both the upper and lower porches with a cup of coffee and watch the sun rise over the lake. 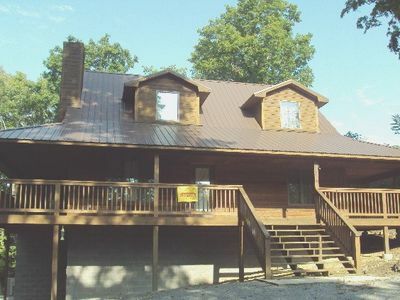 This beautiful 4 bedroom, 4 bath log cabin is perfect for family and friend gatherings and is located on Center Hill Lake. It can sleep 13 people comfortably and has 4 bath rooms, and 4 flat screen TV’s with Direct TV. It is located just 60 minutes east of Nashville and less than a mile from the Center Hill Marina. Center Hill Dam and the Caney Fork River is a short 10 minute drive where you can enjoy fly fishing or kayaking. Within an hour’s drive, you will also find hiking and other outdoor things to do at Edgar Evans State Park, Burgess Falls, Cummins Falls, and Fall Creek Falls. Lake View Lodge offers lots of privacy and over 2700 square feet of living space. You can relax in the great room on the main floor, complete with cathedral ceiling and massive stone wood burning fireplace. This room has comfortable leather furniture and rocking chairs where you can watch the game on the large flat screen 55” TV, or enjoy the lake views through the front windows. The country kitchen has new stainless steel appliances, and is fully stocked with everything you will need during your stay. 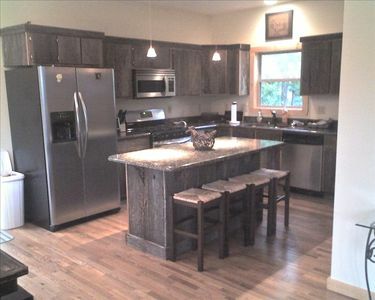 There is also a large island with bar stools, as well as rustic oak kitchen table perfect for meals or game night! 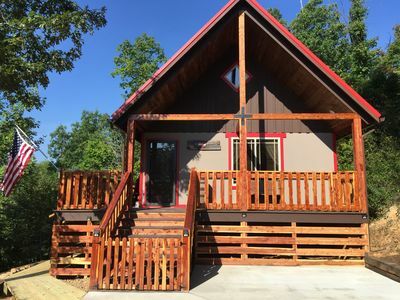 This spaciously designed cabin has a large master bedroom located on the main level with an attached master bath. It also has a flat screen TV, as well as double doors leading out to the front porch with amazing views of the lake and marina. There is a second bath located on this level that boasts a relaxing antique claw foot tub. The upstairs consists of two bedrooms, a full bathroom with tub and shower combination, and a loft, with one bedroom having an antique iron double bed, and the second bedroom has a twin bed, as well as a log twin over a queen bunk bed, and a flat screen TV. The loft also has two additional beds. The bottom level has a large separate living area with leather sofa and flat screen TV, and double doors that lead out to the porch. There is an additional bedroom with a queen sleigh bed and double doors leading out to the lower level porch with a view of the lake. This floor also has a large full bath, as well as a laundry room with washer, dryer and utility sink. 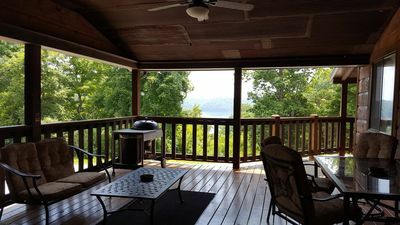 Outside, the main level has a wraparound front porch overlooking the lake with 4 rocking chairs, a swing, gas grill and table for outdoor dining, as well as three ceiling fans. The lower level porch also overlooks the lake and has three rocking chairs and a porch swing. Lake View Lodge is perfect for couples, families, kayakers, fly fishermen, honeymooners or anyone just needing to getaway at the lake! Within walking distance to Stecoah By the Water. 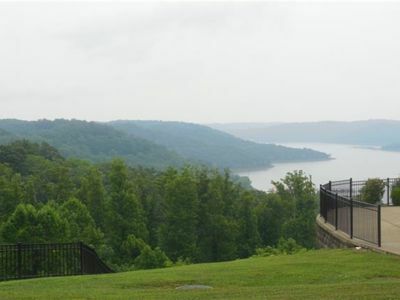 Amazing views of Center Hill Lake/ Edgar Evins State Park at Highland Cove Luxury Condominiums, a gated community. Enjoy easy lakeside living at this upscale exclusive enclave, complete with community swimming pool/ hot tub and access to a full-service marina, 1 hr from Nashville. 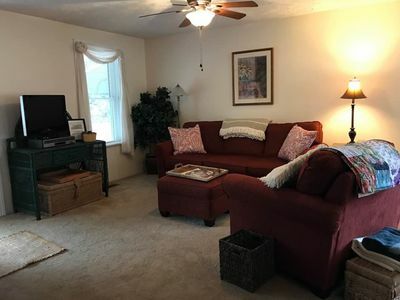 This 3 bedroom, 2 bath condo with lake views is stylishly decorated and fully stocked, with plenty of water recreation, hiking trails, large covered picnic area/outdoor grill. Lots of room to enjoy a relaxing weekend! Beautiful New Executive Condo With All The Amenities. Southern Comfort is an exclusive executive condominium. This condo has a beautiful mountain view, 2 bedroom, 2 baths (jacuzzi in master bath), gas log fireplace, granite counter tops, cherry cabinets and all the comforts of home. Tastefully decorated. Additional sleeping on air mattress fold out bed. During the summer months, enjoy the outdoor mini-amphitheater featuring live bands within walking distance from this condo. This beautiful condo also has a gas grill on a private covered patio. Community swimming pool and resort-style hot tub also available. 3/4 mile to Cove Hollow Marina and minutes to Center Hill Dam, Edgar Evins State Park and I-40. We are sorry, but boat and trailer parking is prohibited in the Highland Cove Gates. Beautiful Contemporary Lake House in Cove Hollow Bay Near Center Hill Marina. 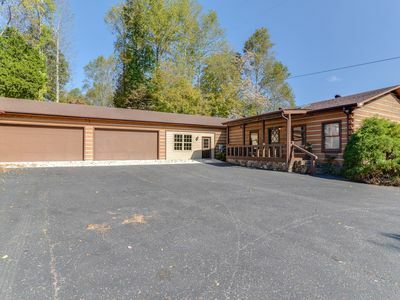 This gorgeous contemporary lake home located in Cove Hollow Bay sleeps 4-6, 2 bedrooms, 2 bath, jacuzzi bath in master, all hardwood flooring, vaulted ceilings, modern contemporary decor, gas grill, gas logs, large great room, wireless internet, 2 flat screen TVs with satellite, loft with futon bed and very nice deck. Located 1 mile from Cove Hollow Marina. Great boat parking. You will be happy that you took the time to stay here in this little Nest. This is a perfect couple's retreat or small family getaway. Located close to Center Hill Dam. This home is located in a gated community. 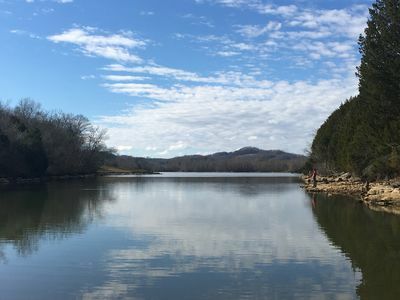 Center Hill Marina is less than 1 mile from the cabin, minutes to Edgar Evins State Park and the Caney Fork River for those who enjoy fishing and fun in the sun. A beautiful Cabin in the Cove! Perfect for any time of the year! Cabin in the Cove is nestled in Cove Hollow on Center Hill Lake. 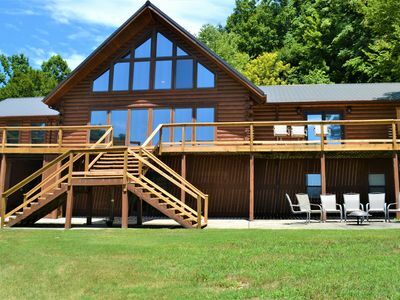 This lovely 4 bedroom, 3.5 bath cabin is perfect for family and friend gatherings. Lots of great hikes in the area. Center Hill Lake is within walking distance and we are 60 minutes east of Nashville. 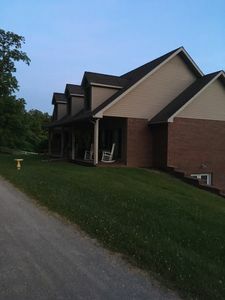 Our home has three private bedrooms and a bunk room, an inviting wrap around screened porch, scenic hiking/walking trails, breathtaking landscape, outdoor fire pit, and a variety of nearby activities to choose from. Free Wifi, DVD player, towels, sheets, bathroom tissue, and a stocked kitchen to include pots, pans, plates, and utensils and weber grill. 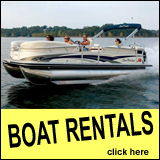 Boat rental is available at Center Hill Marina, just a short distance away. It’s the perfect getaway for a romantic weekend, family vacation, reading retreat or a unique way to enjoy the Cumberland Plateau foothills. 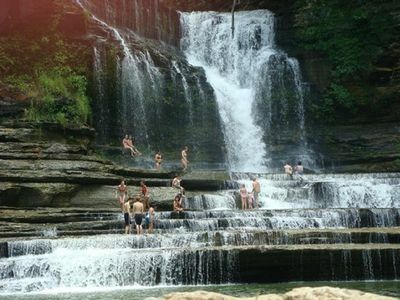 Within an hour you’ll find gorgeous hikes at Burgess Falls, Cummins Falls State Park, Fall Creek Falls, and much more! 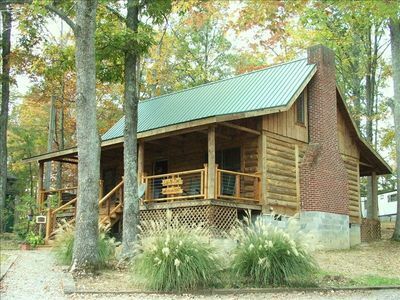 This luxurious log cabin sits nestled on a hillside where you will spend hours enjoying the nature that surrounds you. 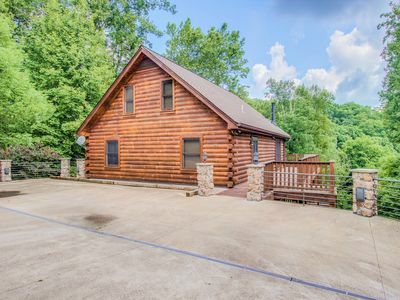 This log home features 4 spacious bedrooms and 3 full bathrooms. The living area has a gorgeous open floor plan with a vaulted ceiling and a loft type view from the master sweet. Large flat screen TV in the living room features Direct TV service and an xbox. Enjoy the luxury of this well stocked kitchen. Perfect for cooking connoisseurs during your stay. Enjoy the two gaming areas on the lower level with a Foosball table and a pool table. In the pool table/air hockey table room you will find a large flat screen TV for your enjoyment with a movie library. There is a gorgeous kitchenette for additional space. 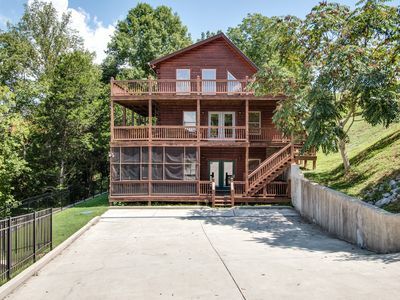 Three levels of wrapped decks compliment this home and provide ample wildlife watching for your entertainment. 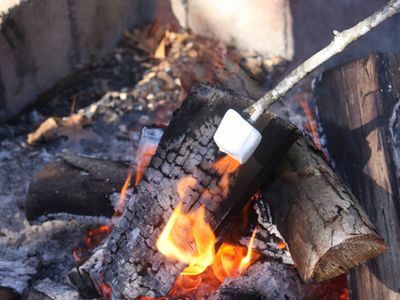 At night curl up next to the cozy fire pit and roast a few marshmallows or tell campfire stories. This is a must stay at cabin for all your vacationing needs. Center Hill Marina is less than a mile away. If you want to tour the Caney Fork River you will want to stay here. Canoe the Caney is just minutes away! Don't miss out on this vacation must! Book Now! 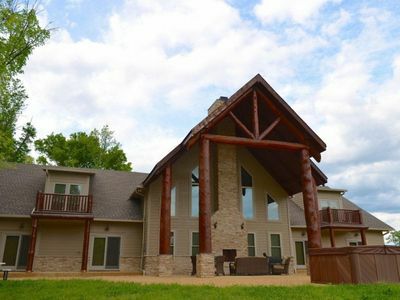 This is a fabulous custom built log home with an open Floor Plan, vaulted wood ceiling and loft. Large stone wood burning fireplace in the living room. 2 Screened Porches with rocking chairs and porch swing. 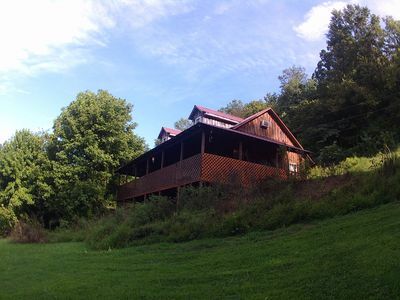 A large 3 acre wooded hill behind the house provides lots of privacy and fun exploration. This house is in a gated community, less than 10 minutes away from a marina and boat slip. A boat slip/lift may be available at the marina for an additional fee. A large park with volleyball net, swings, horse shoe pit, pavilion and cookout area are just across the street. It's common to see deer grazing in this park in the evenings. Cookeville Estate Our calendar is updated in real-time & our nightly rates are accurately displayed. Simply enter your desired dates and click 'Book Now!' Enjoy a true fairy tale vacation in Middle Tennessee at this gorgeous, seven bedroom estate on 11 private acres featuring a media room, two full kitchens, a gym, a pool, and tree-lined property filled with lush gardens, trails, and fields. 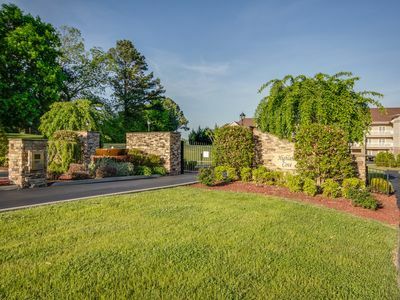 The impressive Cookeville Estate is located just six miles north of Cookeville and boasts easy access to numerous shops, restaurants, and popular local attractions. Those looking to explore will love visiting some of Tennessee's top state parks and other natural areas. Hike to plunging waterfalls or swim and fish in several creeks, winding rivers, and lakes, a few of which are less than 10 miles from this rental. This kid-friendly dream home is the perfect place for a family reunion or extravagant holiday celebration. It offers a wide array of indoor amenities, including free WiFi, two nurseries, a media room with an 80" flatscreen TV, two kitchens, a home gym, and an office. The house is also supplied with two cribs, two strollers, two high chairs, four sound machines, four baby cameras, baby toys, and a trampoline. Outdoors, enjoy the view from the furnished, multi-level deck, fire up the grill and have a big family cookout, or cool off in the beautiful, in-ground pool. The grounds also include two additional spaces for entertaining - a 1,650 sq. ft. barn and an 1,100 sq. ft. shed, both of which are decorated with custom chandeliers and have running water and electricity. Two venues even allow parties - bring your family and friends! Experience the natural beauty of Middle Tennessee at this estate where the only limitation is your imagination. Make your reservation today! 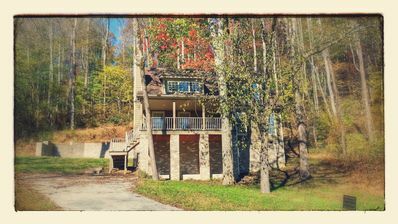 This property is managed by Vacasa Tennessee LLC. Parking Notes: Parking is available on the driveway. For Tranquility, Entertainment And Peace, This Is The Home! 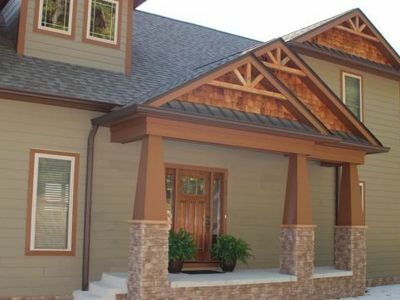 Hawk's nest is a 3 bedroom 2 bathroom lake house located at Captain's Point. This gorgeous view of Center Hill Lake will take your breath away. Enjoy the open floor plan living, dining, and kitchen area with your vacationing guests! This home is decorated with large windows for your nature viewing pleasures. Accommodated with a large high definition flat screen TV, WiFi, and cable, you can curl up in front of the wood burning fireplace to your favorite movie when you are not at the lake. Two of the three bedrooms are large master suites for all your space loving needs. This home features a king master suite on the main floor and a wood burning private fireplace, with a king master suite on the lower level. The suites are complimented by the cozy loft featuring two twin beds. This home is a star gazers paradise. A large upper deck located off the kitchen with a Weber stainless grill, featuring steps to the large back party deck where you can gaze over miles of wildlife. This home also includes a screened in patio with a hot tub for all your relaxation needs. Boat lovers, please bring your boat with you. 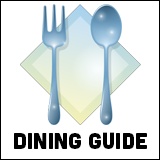 Included in your rental is a covered slip at the famous Hurricane Marina & Blue Water Grill. This slip is compliments of this rental. No additional fee! Book now for this perfect retreat! Wonderful Lakefront 5 bed/5 bath with stunning views in a private setting! 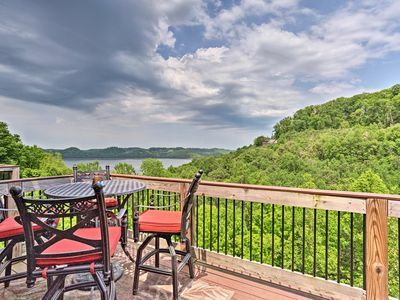 This beautiful 5 bedroom, 5 bath home, overlooking one of God's most gorgeous lakes, nestled among the rolling Tennessee Hills, will make a perfect retreat for you and your family and friends! The views of the lake, especially the brilliant sunsets, will simply astonish you. There are three levels of decks or patios that look out over the lake and are perfectly situated to enjoy the sunsets. 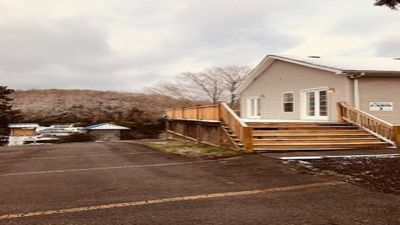 (Therefore the name WestView Cottage) Westview Cottage offers a small playground outside for the kids and a hot tub for the adults and a full size shuffleboard court for all ages. Trust me, you will have a blast playing right around the house! We hope you will instantly feel at peace and relaxed as soon as you enter the front door into the open floor plan of the living room. The kitchen is fully stocked and ready for great family time around meals. We have provided all cookware, serving ware, and plates, utensils and glasses. The kitchen has newer appliances but does NOT have a dishwasher. There is a good size sink and we provide plenty of dish soap. There are three master suites with private bathrooms and two bunk rooms with bathrooms next door to each. The Upper Master is located on the top floor with a king size bed, a private deck and a whirlpool tub in the spacious bathroom. One main level master suite has a king size bed and the other master suite has a full size bed with an extra full size Murphy bed. The main level family room also has two sleeper sofas as well. There is one bunk room with four twin beds on the main level and one bunk room with 5 twin beds and a queen size bed on the lower level. The lower level recreation room also has a pull out sofa. There are plenty of family games in the coffee table chest in the main level family room and a foosball table, pinball machine and an original Galaga arcade game in the lower level recreation room. The recreation room also has a large TV with plenty of movies, a game console, and apple TV. (NOTE: This is the only TV in the house by the way and there is no cable service, but I promise you, you will not miss it because there is so much to do and see!) There is WiFi at the house! The lower level also has a wet bar with an icemaker and a laundry room. I promise you will throughly enjoy the Westview Experience and make memories that will last a lifetime! Center Hill Lake. Hurricane Marina. 70 miles from Nashville. Conveniently located only 4 miles from I-40. Only 1 mile from the best marina with the best restaurant on the lake. Lower unit. Full kitchen complete utensils, plates, coffee maker, dishwasher, etc. Beautiful Lake View. Lower unit - pool table, two bedrooms one with queen bed and one with twin beds. Full baths. Porch/deck overlooking lake. Hurricane Marina has great boat and jet ski rentals. Ideal Center Hill Lake Condo 3 Mins to the Marina! 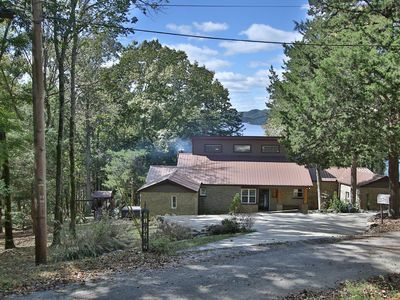 Lago Vista is a gorgeous 3 bedroom, 2 1/2 bath, log cabin that is nestled on a beautiful wooded lot beside the lake. Rock shoreline is 150 feet from cabin. Lake view is restricted in the summer but absolutely amazing in the winter months. Enjoy listening to the boats and water below the cabin. All hardwood and tile flooring, ceiling fans, stone fireplace, granite counter tops and vaulted ceilings. This beautiful cabin sleeps 6 and is well decorated. Master bedroom has king bed and jacuzzi bath tub. 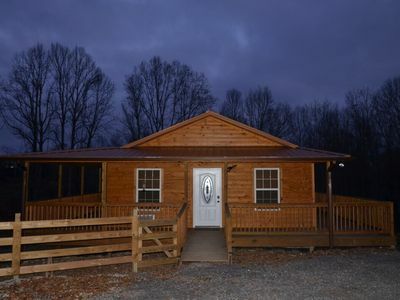 Cabin has a large/open floor plan, board games, WiFi, flat screen HD TV with cable and DVD player, CD player, foosball table, wood burning fireplace, private deck with cozy wooded surroundings, small table and a charcoal grill. The kitchen is stocked for a chef. Community playground and golf course 6 miles from cabin. Great 3/4 wrap-around porch and outdoor fire pit. 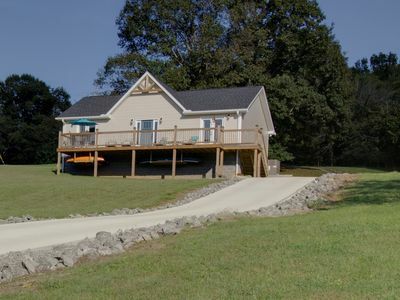 Private community boat ramp walking distance 1/4 mile from the cabin. Hurricane Marina and I-40 are only a 15-minute drive and close to town for convenience. This is a great repeat vacation spot for the family. This beautiful cabin is located on a country lake road. Motorcycles and very low profile vehicles should use caution. We recommend driving a higher profile vehicle for easier access. You cannot launch a boat from the community boat area. It is great for fishing, swimming, launching kayaks/canoes only. There is no boat parking at this property.